The new useful fitness workouts for Arms, Legs and Back, and can do seated Exercises.Helps you get rid of that flabby problem area under your arms. Improves Stretching and Flexibility. Less strain on joints:Minimize damage to joints because of evenly force .You'll instantly feel your muscles toning and tightening as you burn calories without joint strain. Multi-effect function:3 interchangeable colored resistance bands in different power levels.They can be used by single or in combination. Use whatever you want! 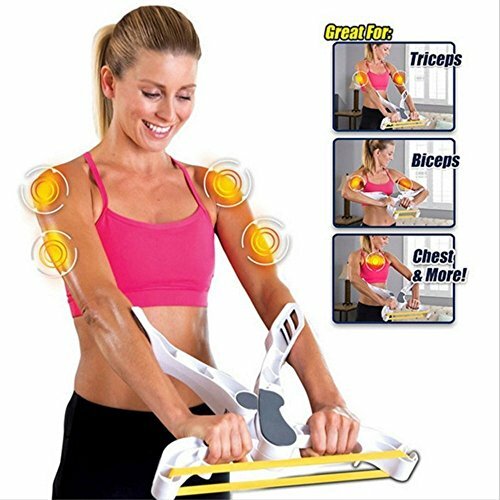 Total arm workout system:Our arm machine unique dynamic resistance movement works your arms,shoulders and back all at the same time.Especially on the triceps/biceps/chest/shoulders/back exercise effect is significant. Folding design. Whether traveling or business trip our arm machine helps you achieve continuous exercise. New for Arms - This new resistance technology strengthens and tones your upper body. Targeting your arms, shoulders, chest, biceps and triceps. Burn Fat - Burns Fat, Burns Calories and has given customers a slimming effect and left customers noticeably more slender. This is great for weight lose! Work out - Your strength will improve quickly showing results in just minutes and is a great morning, noon, night or anytime routine. It will be your favorite activity! Money Back Guarantee - Experience our product for 90 days if you are not satisfied you within that time you can return it. If you have any questions about this product by letton, contact us by completing and submitting the form below. If you are looking for a specif part number, please include it with your message.